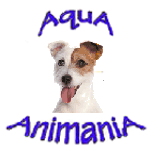 AquA AnimaniA is your #1 local source for dog & puppy supplies and have expert advise on hand to help you properly care for your dogs & puppies! We also carry a comprehensive and extensive line of pet supplies. You can trust AquA Animania for a wide variety of healthy pets, aquarium fish, pond fish, amphibians, reptiles and other small animals! Take care of “man’s (or woman’s) best friend” with dog supplies, dog food, dog treats, dog toys and tons of dog products from AquA AnimaniA. We carry a wide range of canine necessities including dog food, dog treats, dog toys, dog crates, dog beds and much, much more. Whether you are looking for natural dog food options, a stylish new dog collar, cute dog clothing or treats to reward your pup’s good behavior, you can find it all right here at AquA AnimaniA! As always, price and quality guaranteed!